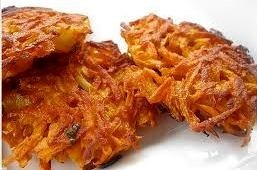 In all my running around to get ready for the first night of Hanukkah, I forgot potatoes! I moved to a new neighborhood so am having to get used to shopping at new stores…I found Hanukkah candles after a little searching…but got home and realized I only had 1 potato and several sweet potatoes..
Sauté onions in butter until caramelized. Stir together potatoes, onions, flour, eggs, salt, and pepper. Heat fat in a deep 12-inch nonstick skillet over moderately high heat until hot but not smoking. Working in batches of 4, spoon 1/8 cup potato mixture per latke into oil and flatten to 3-inch diameter with a slotted spatula. Reduce heat to moderate and cook until golden, about 4 or 5 minutes on each side. Transfer latkes with spatula to paper towels to drain.